The WaridiHome Foundation aims to enhance the living conditions of orphans in their Kenyan families. The Foundation tries to support the families in raising orphan children. This is achieved by providing the basic needs of the children, enabling them to grow up in a safe environment and assuring that they go to school. Those children (and their families) who are eligible to get extra support from the foundation are mostly orphans (due to parents who have died from AIDS, for example). First the foundation will direct their attention to families who live in thevillage of Msambweni. Later on, when the foundation has grown, we probably will focus on the whole Msambweni District. Together with the Children’s Department and the Mwambweni Hospital the foundation will screen the children and their families. Besides supporting the families, the foundation also wants to make a difference in teaching conditions. A pastor in Tswaka opened his church as a shelter for a nursery school. This ‘church/nursery school’ is ready for a makeover. At the moment it is our plan to support this nursery school, an important local program. 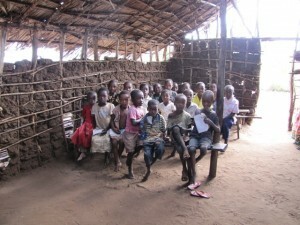 The school provides care for children who are not able to make long walks to the public school. In the future we also will be looking into other local projects to support in the Msambweni District.